You haven’t fully experienced Royal Trux until you’ve heard Twin Infinitives, a CD reissue of its 1990 double LP masterpiece. Recorded by Greg Freeman in San Francisco in the late 1980s, at the height of the duo’s heroin addiction, the album is Neil Hagerty and Jennifer Herrema’s bewildering collection of musical space junk, wandering satellites, floating synapse creatures, and radio waves from distant worlds. Most of the instruments used here are probably not man made, instead some alien’s useless garbage dumped on Earth long ago. Heard are bleeping ray-gun sounds, sputtering beats, static, rhythms and noises heard from within the body, and recordings of the circulatory and nervous systems, with the microphones tapped directly into the heart and bloodstream, where courageous red blood cells and killer T-cells eternally battle invading bacteria and viruses. 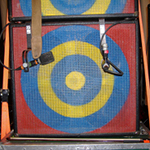 The guitar and vocals are treated and distorted beyond recognition, as if the master tapes were run through the washer and dryer a few times too many—the sounds are incredibly unlistenable and the words difficult to decipher. Twin Infinitives is the soundtrack to slow-moving nightmares inside the head. While recording the music, Neil and Jennifer probably rigged up one of those communications devices E.T. had, like the one he built from an electrically altered Speak & Spell, an umbrella, a turntable, and various circuitry. 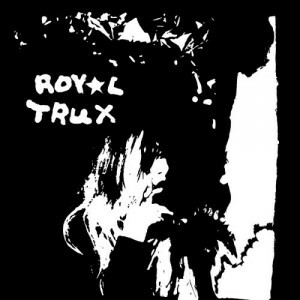 The resulting tapes of Royal Trux’s audio waves transmitted and recorded from Pluto and beyond ended up on song such as “Solid Gold Tooth” and “Chances Are Comets in Our Future.” Dog whistles and echoes surface on “RTX-USA.” Track three features the side-long “(Edge of the) Ape Oven,” a fifteen-minute epic that travels through the underworld and beyond. The last song, “New York Avenue Bridge,” is the most normal sounding on Twin Infinitives; it involves only a piano and Jennifer’s guttural voice: “Yesterday my jeans looked unreeeeaaaaal,” as if she’s barely hanging on, waiting around for her next fix. Fans of Royal Trux who turn on Twin Infinitives may initially be shocked at what they hear. However, they’ll soon find something new with each listen. Simply put, Twin Infinitives transcends ordinary rock, making baffling connections between heaven and hell, between Earth and space, between physical body and the intangible mind.